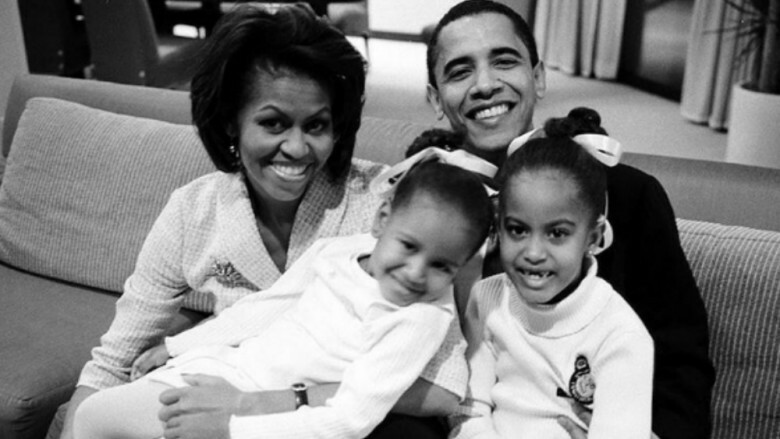 Now that their presidential dad, Barack Obama, and first lady mom, Michelle Obama, have vacated the White House, let's take a closer look at the super-famous siblings' past, present and future. You may be surprised by the good, bad, and, well, super normal dynamics within this history-making family. When she was a baby, Sasha suffered from a serious case of meningitis, which causes inflammation of the brain and spinal cord. The illness took a major toll on the entire Obama family. "People ask me what was the hardest time in my life — they ask, well what about during the debt ceiling debate and this and that and the other thing," President Obama told reporters in 2012 (via Politico). "Sasha got meningitis when she was 3 months old. I still remember going to the hospital together and they had to give her a spinal tap." He continued: "Your world narrows to this very small point. There's one thing you care about and you don't care about anything else." Fortunately for the entire family, Sasha made a full recovery. 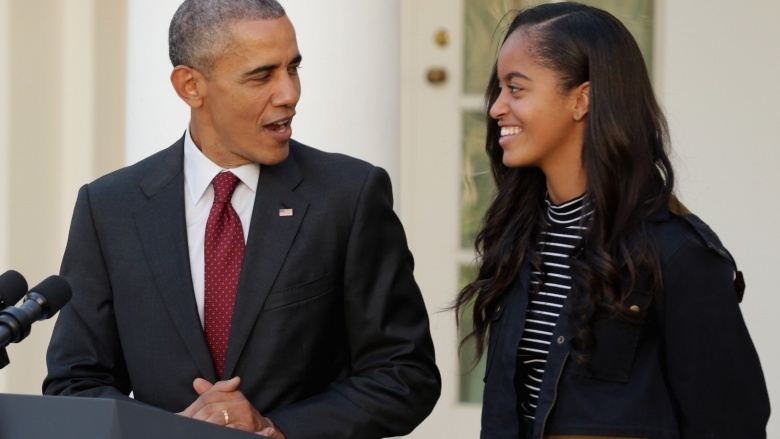 Here's something that will make you feel old: after moving into the White House at age of 10 in 2009, the Obamas' oldest daughter, Malia, is going to college. In May 2006, the White House announced Malia was opting to take a gap year before heading off to Harvard University in 2017. The administration did not discuss what she planned to do during that break, but the hiatus turned out to be a public relations nightmare plagued by scuttlebutt about partying, smoking, and provocative dancing — which is not really news unless you're the president's daughter. When President Obama's two terms in office concluded in January 2017, the family didn't jet off to a private island and disappear forever. Instead, the Obamas reportedly plan to stay in the Washington, D.C. area for the foreseeable future. The reason: to let their youngest finish school. 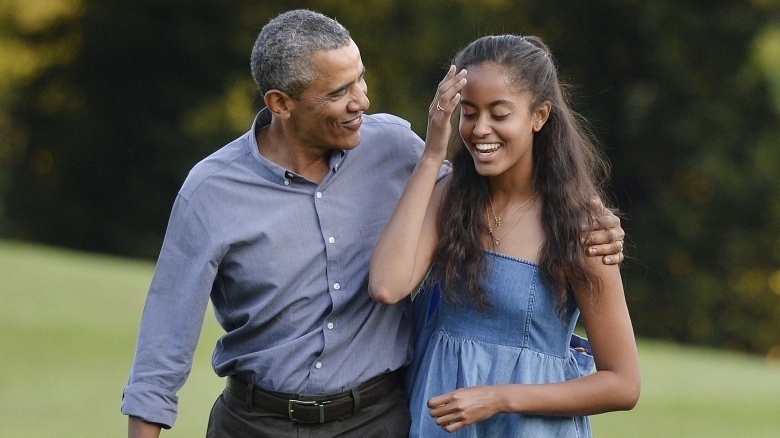 "We're gonna have to say a couple years in D.C., probably, so that Sasha can graduate," the president told reporters at a luncheon in Milwaukee (via ABC News). "Transferring somebody in the middle of high school [is] tough." 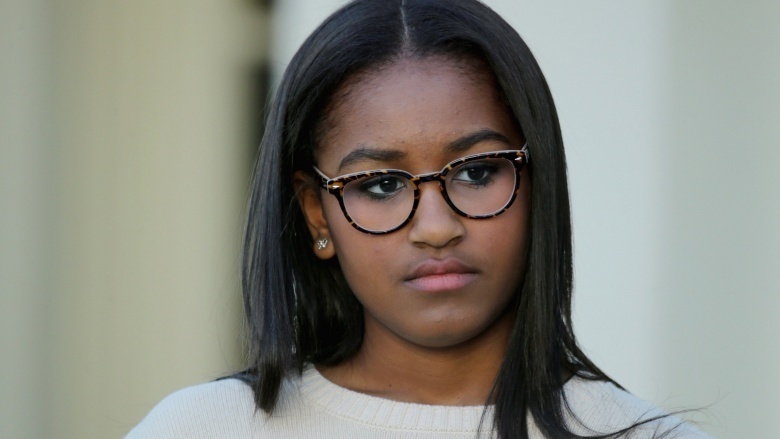 Sasha, who turned 16 in 2017, attends the private Sidwell Friends School in D.C., so whether you love or loath Obama's politics, you probably haven't heard the last from our 44th president. In 2015, Malia became the envy of young adults across America when she was hired as an intern on the set of Lena Dunham's hit HBO comedy Girls. At the time, her duties were shrouded in secrecy, with Page Six even quipping, "It wasn't clear if Malia did any work or would appear in an episode. But in 2017, Girls creators Lena Dunham and executive producer Jenni Konner told Howard Stern that although Malia was willing to do any job on set, they certainly wasn't about to have her fetching coffee. Instead, they said they mostly trained her for the job of a writing assistant. 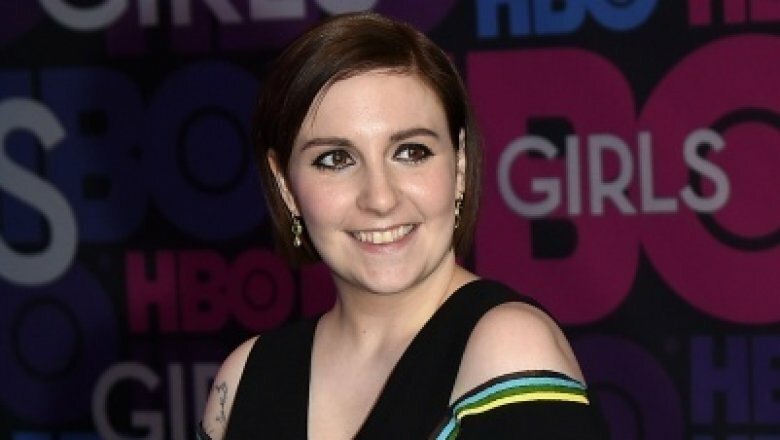 "She's an angel," Dunham said of the eldest first daughter, adding, "She's so smart." This isn't the first time Malia has interned on the set of a hit TV series. In 2014, she spent a summer on the Halle Berry sci-fi drama Extant. That internship was supposed to be top-secret, but it was eventually leaked to the press. "I can tell you that she is graceful, and lovely, and just charming and delightful … she's pretty remarkable," actor Camryn Manheim told Entertainment Tonight. "Any parent would look at her and be proud. Malia's internships weren't just a way for her to pass the time or simply use her family's connections to rub elbows with the rich and famous. 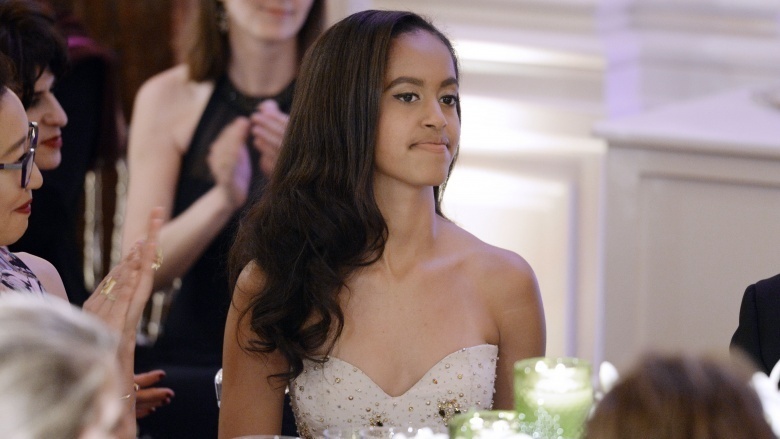 Malia has legitimate aspirations of becoming a filmmaker, reported The New Yorker in 2014. That might be one reason the press took such an interest in Malia's reported 2015 visit to New York University, which has one of the top filmmaking programs in the country. In 2017, Malia returned to the Big Apple for yet another internship, this time with The Weinstein Company. According to TMZ, Malia spent her days at the film production company reading scripts. Of course, this was before the massive scandal that brought down co-founder Harvey Weinstein. Malia hasn't made any public statements regarding the scandal, but in a joint statement (via Deadline), her parents said that they were "disgusted" by the allegations against the movie mogul, and that "any man who demeans and degrades women in such fashion needs to be condemned and held accountable, regardless of wealth or status." 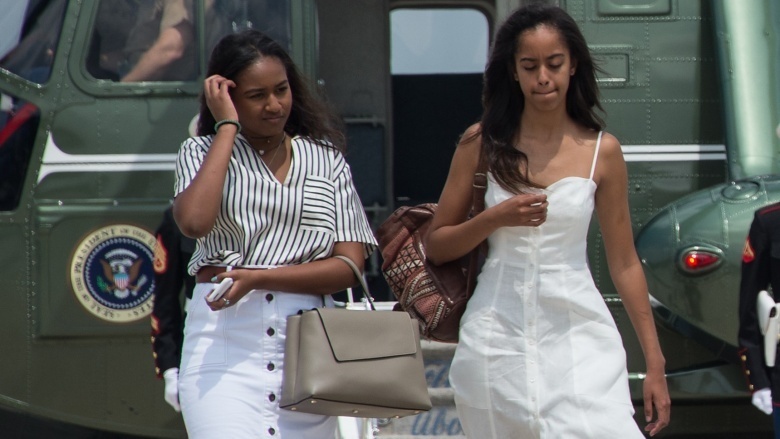 Just because they're the daughters of the President of the United States, doesn't make Sasha or Malia any different from your average moody teenagers. "You get these teenage moments—they love you, but what I think really affects you most is they just don't have time for you," their dad told GQ magazine at the end of 2015. "It's not an active disdain for you. It's just their calendars start filling up and they've got all these friends who are much more interesting." While Obama admits this stretch of time will be "painful," he's taking it all in stride. "The compensation you get for the fact that they don't have time for you is: Nothing beats watching your children become smarter and cooler than you are," he said. "And you suddenly will hear them say something or make a joke or have an insight and you go, 'Wow. I didn't think of that.'" 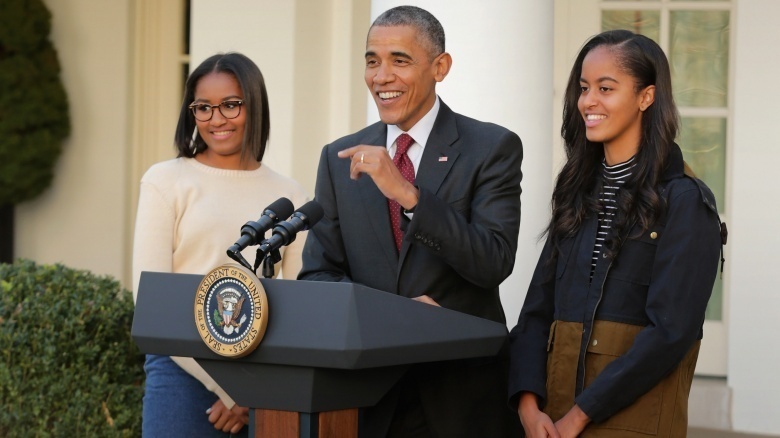 When he leaves the White House, President Obama won't have to worry about keeping our country safe or juggling a divided Congress, but he is going to have a whole new set of issues to contend with, like, you know, dealing with his daughters' dating lives. Obama already says he's none too pleased when he spots guys eyeing his oldest, Malia, who turned 19 in 2017. "I've seen some folks glancing at her in ways that made me not happy," he told GQ magazine. In the past, he's joked about his daughters dating, telling reporters, "What I've told them before is, as long as that young man is showing you respect, and is kind to you, then I'm not going to be hovering over every second." So, basically, the president is just like any other nervous dad. Of course, Sasha's stint at Nancy's wasn't totally normal. She reportedly worked only four hours a day under the protection of six Secret Service agents, and the gig lasted just one week. But, as anyone who's ever worked in the service industry will tell you, one day behind the cash register comes with enough stress to last a lifetime. As any working parent will tell you, juggling a career and family is one of life's most difficult tasks. Just ask the first lady. 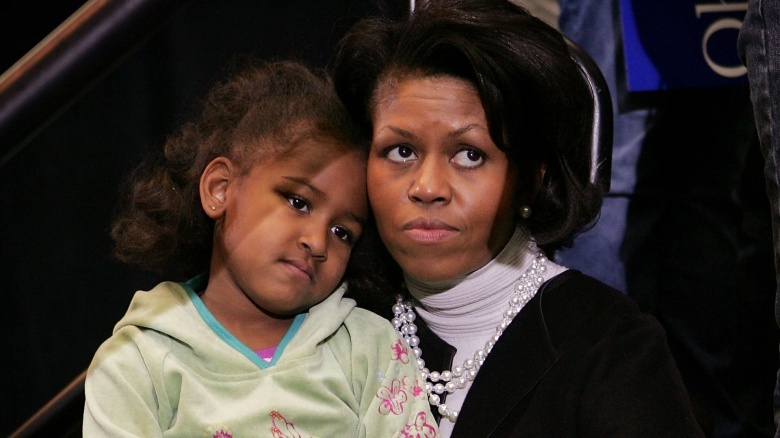 Speaking at the White House Summit on Working Families in June 2014, Michelle revealed she once had to take four-month-old Sasha with her after the University of Chicago Medical Center called her in for a job interview. "Who I was at the time was a breastfeeding mother of a four-month-old and I didn't have a babysitter, so I promptly took Sasha to the interview with me," she said (via the Today show). "I thought, look, this is who I am. I've got a husband who's away. I've got two little babies. They are my priority. If you want me to do the job, you've got to pay me to do the job and you've got to give me flexibility." Michelle went on to become one of the hospital's vice presidents, according to the report. "It was one of the best experiences that I had because (my employer) put my family first and I felt like I owed that hospital because they were supporting me," she said. 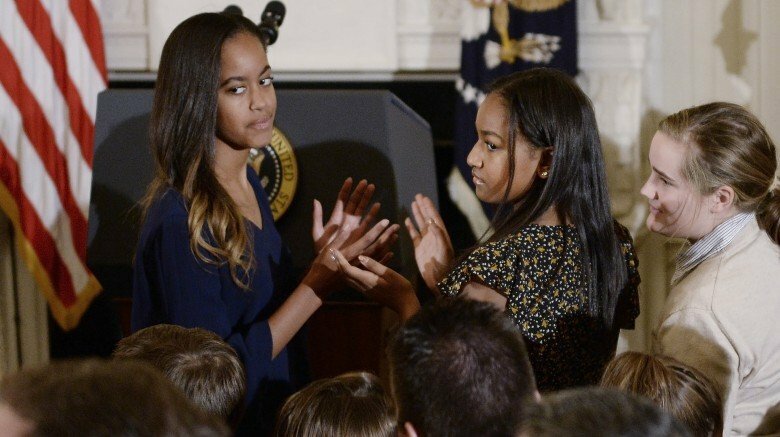 When Malia celebrated her 16th birthday in 2014, the question on everybody's lips was "Who the heck is going to teach her how to drive?" The first lady finally answered that question the following year during an interview with talk-show host Rachael Ray. 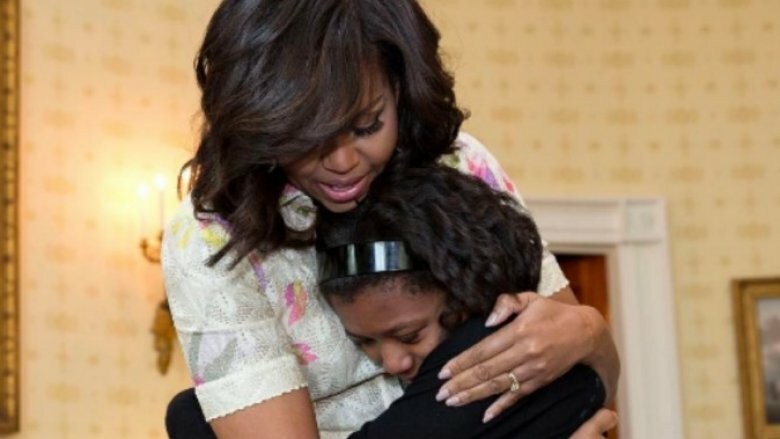 "The Secret Service [actually taught her] because they wouldn't let me in the car with her," Michelle quipped, adding she hadn't driven a car in seven or eight years. "Driving for Malia, I think, gives her a sense of normalcy, like the rest of her friends are doing," Michelle continued (via E! News). "And my kids have got to learn how to live in the world like normal kids." Although the Secret Service did most of the heavy lifting, Michelle may get in a little mother-daughter bonding behind the wheel after the family leaves the White House. "You know, I was joking the other day, I just want to ride around in a car with the window open," she said. 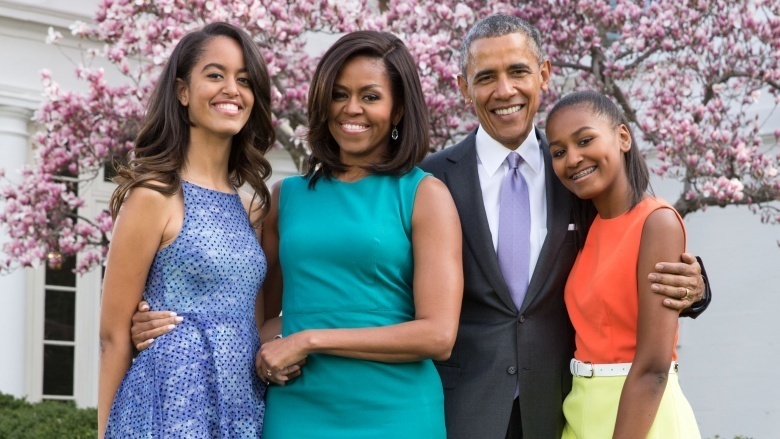 Despite their presidential status, the Obamas tried to keep their daughters grounded in reality while growing up in the nation's capital. One tactic: keep materialism to a minimum. Michelle and Barack told People in 2008 they didn't even give the girls gifts on their birthdays — justifying that the expense of the party alone was enough reward for the occasion. "They get so much stuff that it just becomes numbing," Michelle said. "Malia believes there is still a Santa Claus even though she's a little wary because some of her friends are non-believers. 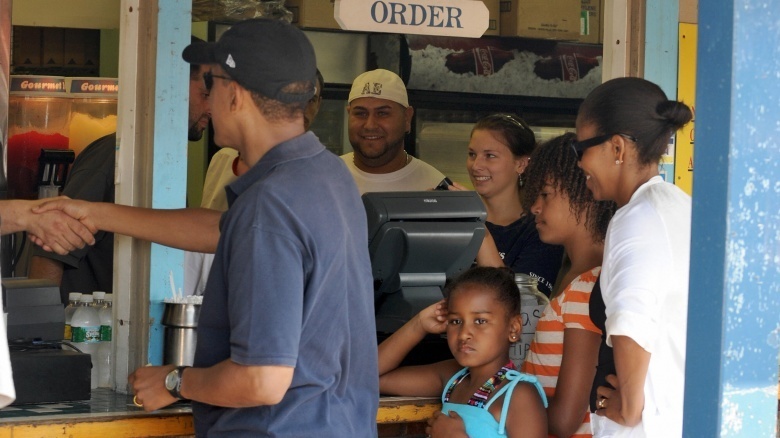 But Malia says, 'Ma, I know there is a Santa because there's no way you'd buy me all that stuff.'" If Malia and Sasha Obama thought moving to the White House meant getting waited on hand and foot, boy were they in for a rude awakening. Michelle and Barack made sure the girls kept a strict schedule that included an 8 o'clock sharp bedtime and an ordinary routine of daily chores. As detailed by The New York Times, Malia and Sasha were expected to make their own beds, clean up their dog's bathroom piles, and get themselves ready in the mornings for school. According to The New York Times, the girls' allowance for chores in those pre-White House days was pretty slim, too. They reportedly made just a dollar a week for helping out around the house, with obligations like setting the table and picking up their toys. 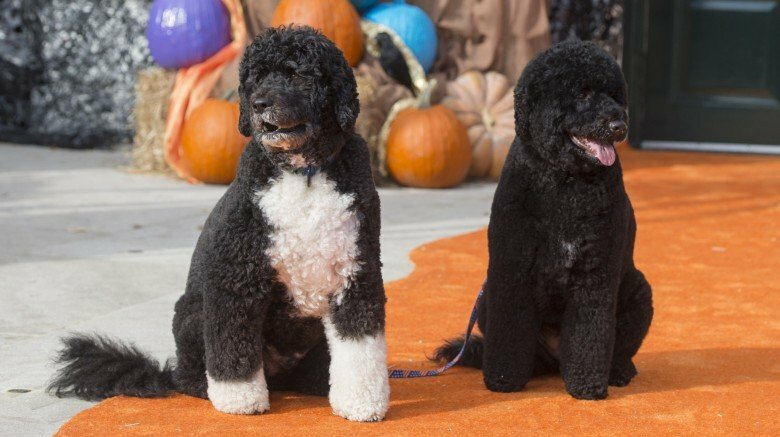 Their allowances might've been scant, but the Obama sisters did get a very nice thank you gift from their parents after their dad won his bid for the White House: a Portuguese water dog named Bo Diddley. The animal was a gift from Sen. Ted Kennedy and fit the family's criteria for a desired breed — namely, he is a hypoallergenic dog, which was of chief importance because of Malia's allergies. Bo was named by the girls — drawing inspiration from a friend with a cat named Bo and Michelle's father, was nicknamed Diddley. The first family added a second dog, Sunny, in 2013 to help fill the void left by Malia and Sasha growing up and not having as much time for Bo (or their parents, for that matter). As Barack told CNN, "Bo was getting lonely because the two other puppies are grown up. And they still have some responsibilities for him, but they're not always around between school, sports practice, all that stuff. And so Bo was getting a little down in the dumps inside the house." 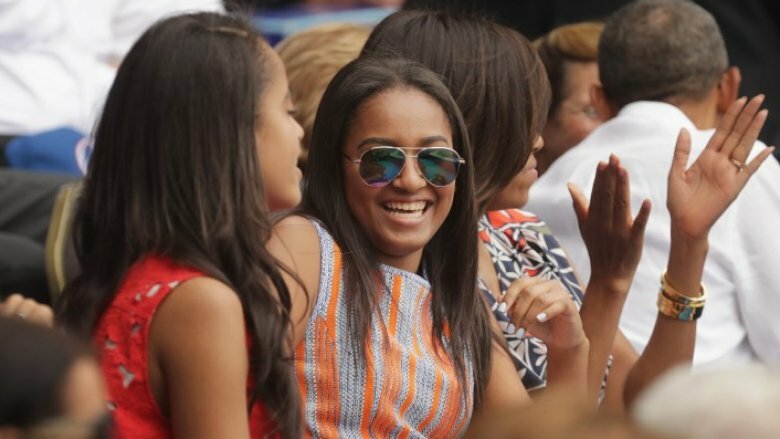 President Obama was a big fan of basketball and football, but his daughters' recreational activity of choice (well, sort of choice) is tennis. Michelle told crowds at the 2013 U.S. Open that she nudged her kids onto the court because of her own lack of access to the sport when she was growing up. She told The New York Times that one of her rules for the girls was to play two sports — one they enjoyed, and one they didn't pick. "I want them to understand what it feels like to do something you don't like and to improve," she explained. Malia, in particular, became very good at tennis and was even considered to be on track for a potential college career in the sport. 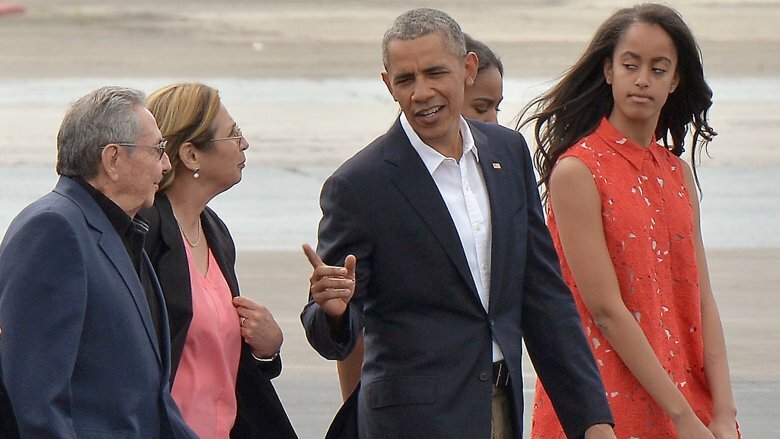 When the Obama family made its historic trip to Cuba in 2016, it was Malia who most of the talking. The then-President told ABC News that his eldest daughter had become so strong with her Spanish-speaking skills that she actually served as his personal interpreter during the trip. "Her Spanish is much better than mine, and I'm hoping she has a chance to get entirely fluent," he said. To practice, Malia joined some of her classmates on a trip to Oaxaca, Mexico in 2012, then enjoyed a summer 2016 embassy internship in Spain, before embarking on a secret three-month trip to South America later that year. 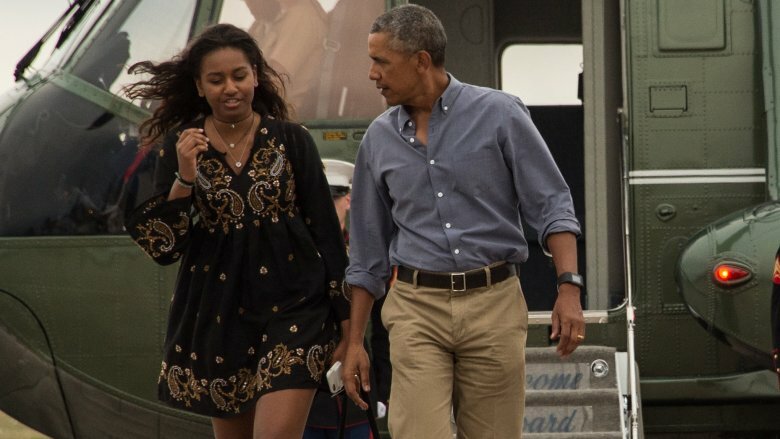 Once Malia and Sasha Obama became old enough to start dating, their dad joked that he wasn't concerned about their safety while in the company of any gentleman callers for the simple fact that they had their own Secret Service security details to supervise said dates. But another reason he wasn't fazed by the idea of his daughters developing romantic relationships is the example set for them by Michelle. He told WDCG News (via TMZ), "Michelle, she's such a great example of how she carries herself, her self-esteem not depending on boys to validate how you look or you know, not letting yourself be judged by anything other than your character and intelligence. And hopefully I've been a good example in terms of how I've shown respect to my wife." Much like every other parent in the world, Barack and Michelle have faced the difficult challenge of raising kids in the age of social media. 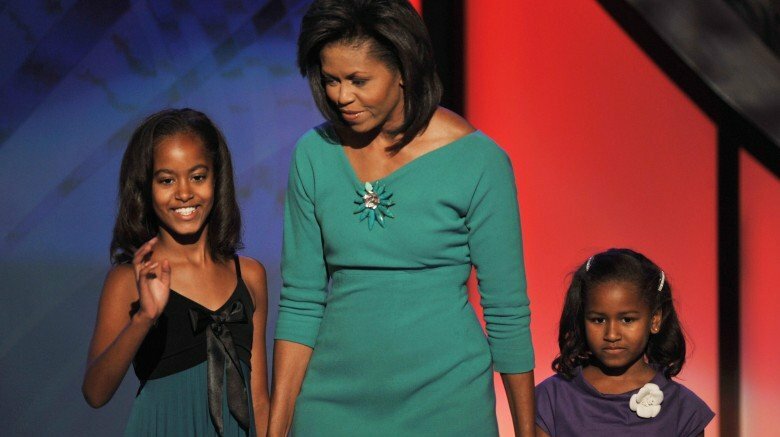 Speaking to Barbara Walters in 2013, Michelle revealed that Malia, then 15, had been limited to Facebook only, while Sasha, then 12, wasn't allowed on social media at all. "I still am not a big believer in Facebook for young people … particularly for them, because they're in the public eye," Michelle said (via People magazine). "Some of it's stuff they don't need to see and be a part of … So we try to protect them from too much of the public voice." In recent years, their tight leash may have loosened a bit. In 2016, the president let it slip that Sasha now has access to Twitter. "Everybody can tweet, but nobody actually knows what it takes to do the job until you've sat behind the desk," he told a crowd in North Carolina while campaigning for the Democratic presidential nominee Hillary Clinton (via The Washington Post). "I mean, Sasha tweets, but she doesn't think that she thereby should be sitting behind the desk." How, and when, and where she tweets remains unclear, but if six Secret Service agents accompany her to a week-long summer job, good luck trying to find her online. ​Did a selfie of Malia leak online? 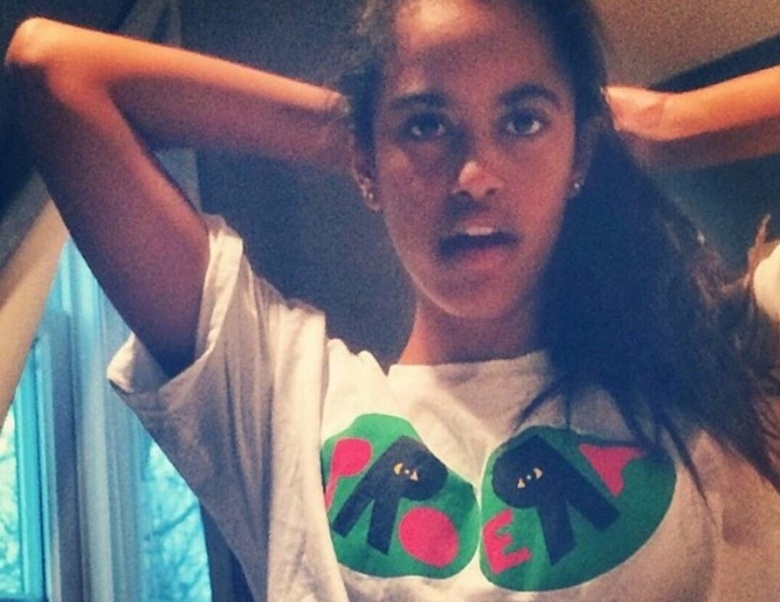 In January 2015, Fox News reported that White House officials were investigating how a photo that appeared to show Malia wearing a t-shirt of the rap crew Pro Era made its way online. 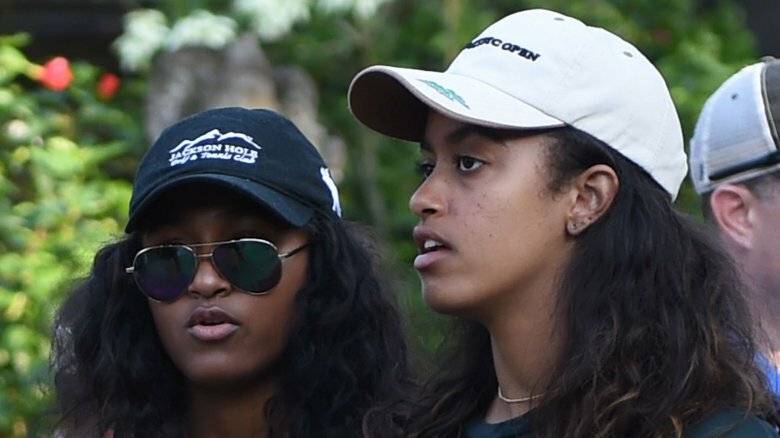 The photo initially made headlines after Pro Era posted it from its Instagram account with the caption, "Malia Obama rocking that classic Pro Era tee! Make sure you get your official Pro Era gear from theproera.com!" 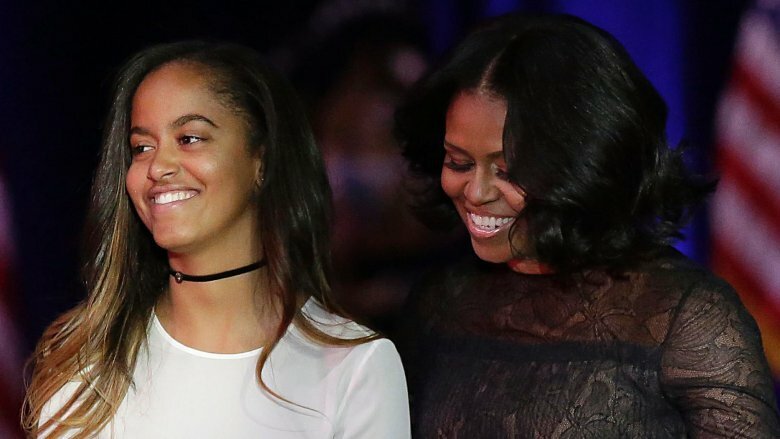 Much speculation ensued when Sasha was missing from her father's farewell address in Chicago, particularly since part of his speech was a touching tribute to his family. As important as the event may have been, priorities are priorities, and Sasha's main job at the moment was being a student. She reportedly had a science test scheduled for the morning after the speech, so she was unable to travel to her home city to witness her father's speech in person. During an interview with the former president on My Next Guest Needs No Introduction with David Letterman, the venerable late night host recounted a "never before told" story about a run-in he had with Malia. 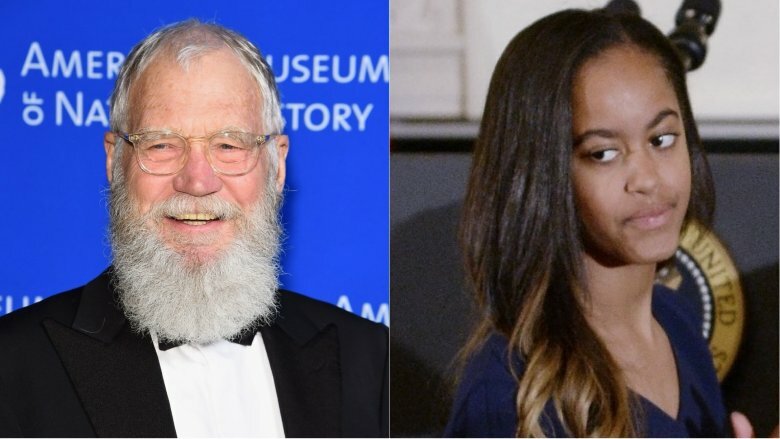 According to Buzzfeed, Letterman said he met Malia at a function at the White House. To introduce himself, he said, "My name is Dave Letterman and I'm very happy to be here at the party, and thank you for inviting me to the party." In return, Letterman claims Malia said, "Yeah, you look like a guy who really knows how to party." Letterman said he absolutely loved the burn. The anecdote also got a huge laugh from former president Obama, who then said, "She's a riot. … She is funny." We wonder who she gets that from? President Obama hadn't even been in office for a month before his family faced their first giant scandal: Beanie Babies ripping them off! 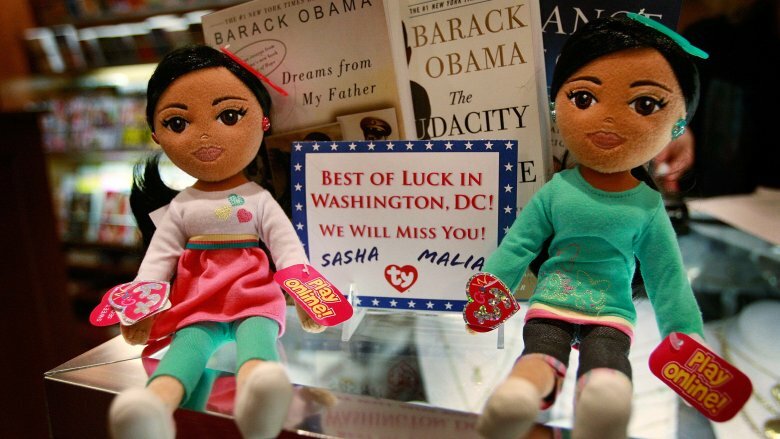 Okay, maybe it was less of a priority than, say, the crashing U.S. economy at the time, but the first lady still took the time to call out the collectible plush toymaker over its "Sweet Sasha" and "Marvelous Malia" dolls. According to The New York Times, the company that made the dolls, Ty Inc., "insisted that the dolls were not intended to depict the Obama girls," but the East Wing wasn't buying it. A statement from the office of the first lady expressed displeasure with the use of "young, private citizens for marketing purposes." Ty Inc. apparently didn't want to get on the wrong side of the White House, so the company "retired" the dolls one month after it started making them, a move that a spokesperson for Michelle said was "appreciated." Anyone want to guess how much a "Sweet Sasha" goes for on eBay these days? Don't click on that, it's actually depressing. In 2016, both Malia and Sasha were invited to be bridesmaids in the wedding of two longtime Obama staffers. According to the Daily Mail, the first daughters stood alongside Kristen Jarvis, Michelle's former chief-of-staff, and Shuan West, a former secret service agent, as they said their vows. Though the couple made its wedding announcement behind a PIN-protected account on The Knot, the Daily Mail reported that Jarvis went out of her way to compliment the younger Obama daughter, allegedly referring to her as "one of the sweetest and downright coolest people." Jarvis also allegedly wrote, "Sasha and I have had a big sister/little sister relationship since the very beginning and there is nothing I wouldn't do for this girl — and I know she would do the same for me." According to TMZ, the Jarvis/West nuptials cost $300,000 and featured entertainment from "R&B stars Ledisi, Eric Benet, and Kenny Lattimore," so even if the girls had to wear hideous bridesmaids dresses, at least they got to do it at a pretty swanky party. 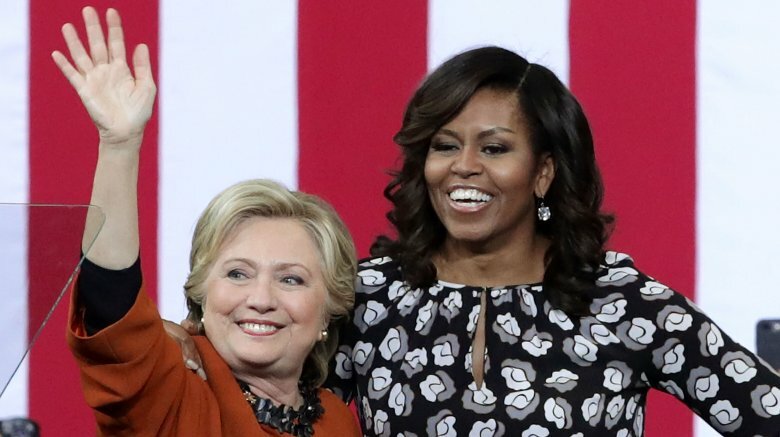 In her first interview since leaving the White House, Michelle shed some light on the family's new digs, and it turns out Sasha was the big winner in the situation. Speaking with Ellen DeGeneres, Michelle said, "Sasha actually killed in this house — She's got this two-room suite, it's all decked out. She's got like a living room area and a bedroom, and she designed it." Michelle said that Sasha deserves the luxe treatment because, "she's the baby." As for how Malia made out? "[She] got a room up in the attic somewhere. She's away at college. You don't waste rooms on college kids," Michelle said. Barack didn't do much better than his eldest daughter, allegedly getting stuck with "the smallest room for his office" and being "short-changed" by not getting enough closet space. Feeling bad for Barry right about now? Hold that thought, because in 2017 the Chicago Sun-Times quoted the Washington Fine Properties listing of the Obama's new abode: "gracious public rooms, 8-9BR/8.5 spa baths w/exquisite finishes, fully finished lower level w/au-pair suite, and approx. 8,200 finished sq.ft. Stunning oversized terrace/formal gardens, 2 car gar parking & gated courtyard for 8-10 vehicles." Sounds like everyone made out just fine in this deal. 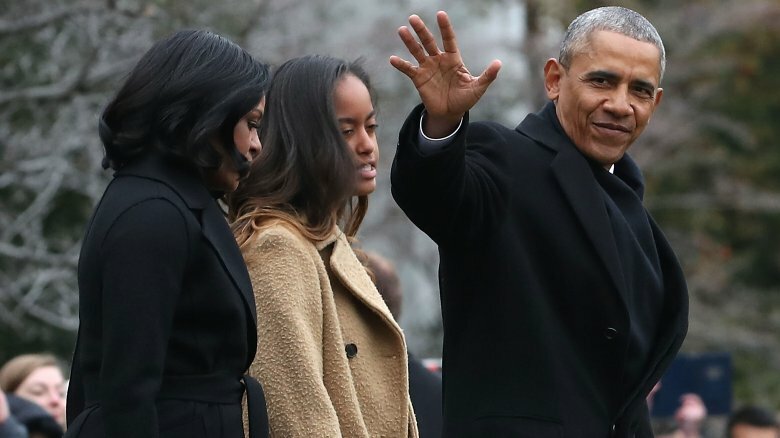 According to Barack, the election of Donald Trump to succeed their dad in the Oval Office was a bummer to his daughters because they believed in the messages of support he and Michelle had offered on behalf of Hillary Clinton during the campaign. Barack told USA Today, "They were disappointed. They paid attention to what their mom said during the campaign and believed it, because it's consistent with what we've tried to teach them in our household, what I've tried to model as a father with their mom, and what we've asked them to expect from future boyfriends or spouses." He added that he and Michelle have tried to foster resilience in their daughters. "They have not assumed that because their side didn't win or because some of the values that they care about don't seem as if they were vindicated that automatically America has somehow rejected them or rejected their values." 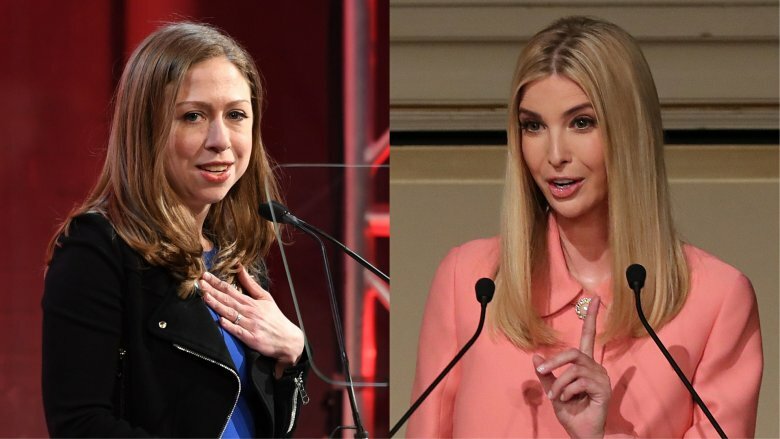 By the time the Obama girls left the White House, they'd experienced elite international travel, interactions with some of Hollywood's heaviest hitters, and a rare insider look at the inner workings of the U.S. government at its highest level. But when it came time to say goodbye to Pennsylvania Avenue, they did it in the most low-key way possible: by having a sleepover with friends. Speaking with Today, Michelle revealed the the girls simply wanted "pizza" and "nuggets" for the eight girlfriends they invited over on the family's last night in the White House. Asked whether leaving was difficult for the girls, Michelle said, "So that moment of transition, right before the doors opened and we welcomed in the new family, our kids were leaving out the back door in tears, saying goodbye to people." Did they not know they were moving into a mansion with "spa baths w/exquisite finishes?" Because something tells us that may have dried up those tears a bit. After his original inauguration, President Obama penned an open letter to his daughters, Malia and Sasha Obama, in Parade, highlighting his hopes for their future. In addition to thanking them for their participation and patience during his campaign, he said his public policy goals and decisions were influenced by his aspirations for them. "I realized that my own life wouldn't count for much unless I was able to ensure that you had every opportunity for happiness and fulfillment in yours. In the end, girls, that's why I ran for President: because of what I want for you and for every child in this nation."